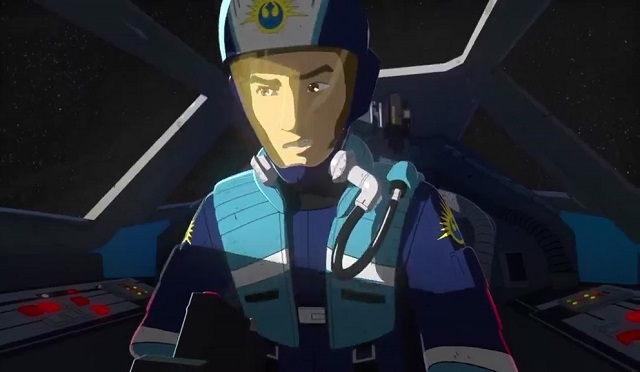 Star Wars Resistance is starting to wind down its first season and is promising all sorts of terrible and incredible things to come, most of which were given glimpses in the show’s midseason trailer. General Hux’s speech! Starkiller Base! Kaz talking with Leia! Tam captured by the First Order! The trailer seemed to be casting out a siren’s song, as most trailers are wont to do. “Come see, come watch, lots of things are going to be happening in the second half of the season, you’ll see!” But the difference with Resistance’s trailer is the emphasis on events. A lot of things are going to happen, things that will set up a lot of character changes and growth, things that we have context for from other places in the universe as a whole. Up until now, the show hasn’t been about those events, it’s been about the characters. The Clone Wars and Rebels both had large events that prompted character dynamics early on, and fed directly into the characters’ arcs through the early going of the shows. Rebels showed us Ezra’s Jedi training over the course of the first season, illustrating both his personality and his flaws as well as his path for growth. Ahsoka likewise was introduced as a young trainee with much to learn, and as TCW went along we saw the tough lessons she had to learn in the path of being a child thrown into war. 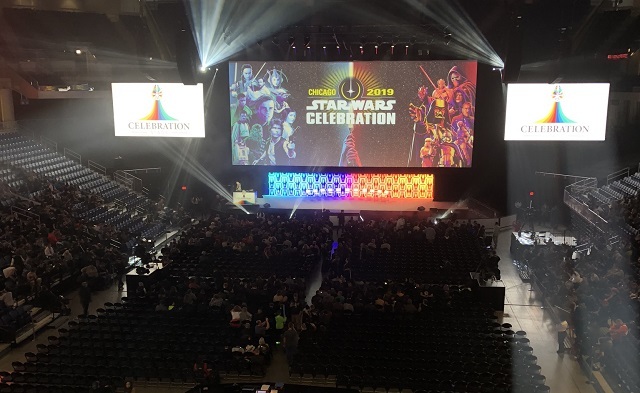 Those were relatively small shakeups compared to the monumental ones that would occur later on in their respective shows, but that’s part of what necessitated that initial speed. The big difference between those shows and Resistance is that Resistance introduced us to Kaz, shook him up by switching his allegiance from the New Republic to the Resistance, but that is where the big events stopped for now. We have not seen a lot of growth in Kaz stemming from that event, nor how it has majorly affected his path forward as a character. Resistance’s first season has been much slower in terms of plot developments or big events than the shows that have come before. The emphasis has been much more on seeing the lives and daily happenings around Kaz, Tam, Neeku and the others on the Colossus. We’ve gotten to know them and see what their status quo is, what their thoughts and feelings are on the state of the galaxy. But the focus has been very local, specific to the characters and their specific foibles and struggles. Kaz’s effort to get to know the other pilots. Yeager and his reluctance to open up to others. Tam’s frustrations with being shut out. Synara’s doubts about her place and her path. These arcs have not been high stakes, and only occasionally has anyone’s life even been at risk. » Read more.. While Poe having faith in his friends and comrades is a fundamental reason why Finn leaves the First Order and joins the Resistance, there is a subtext to Poe’s arc in TLJ that sometimes he can lean too much on this faith and not enough on facts or logic. It’s Poe’s faith in his comrades to do the impossible that lead to the loss of Cobalt Squadron, and his faith in Finn and Rose’s plan that almost destroys the Resistance entirely. And, rewinding the timeline a bit but moving forward in out-of-universe time, we come now to his faith in Kazuda Xiono. » Read more..
Re: Resistance – Hello Kaz! 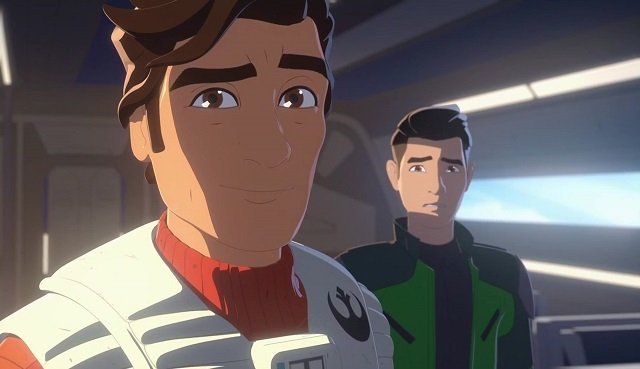 In light of there being four episodes’ worth of Star Wars Resistance out and available through some platforms, while others are limited to watching only the two-part pilot or (in the case of our international friends) nothing at all at the time of writing, it’s difficult to know what exactly to write about. I don’t want to overly spoil things for people who have not had the chance to watch all four episodes that I had access to, yet at the same time why read an article explicitly discussing the show if you have not watched any of it? So here is my compromise: rather than discuss the ins and outs of the plot that has been thus far shown, since the plot itself is still very much a work in progress and will likely burn slowly over the season’s course, let’s talk about the characters. Specifically, let’s talk about a character, the one that is both the most exposed, and most divisive, of the show: Kazuda Xiono. Kaz is our main character, a “gifted but green” pilot who begins the series flying for the New Republic and is recruited into the titular Resistance by Poe Dameron after catching the elder pilot’s eye on a mission in deep space. He’s also the sort of personality that is pretty much instantly recognizable to devotees of Star Wars animation since he shares traits with the protagonists of every modern series from the franchise thus far. His youth and enthusiasm have echoes of both Ezra Bridger and, to go even further back, Ahsoka Tano. As with Ezra and Ahsoka, Kaz has a very distinct and strong personality which can certainly be off-putting for some people, but I believe that goes for most of the cast of Resistance in general. Especially in the pilot, everyone’s portrayals are dialed up to eleven to make sure we know who they are and what they’re on about, and we’ll start to get more nuanced as time goes on and the story spools out more. 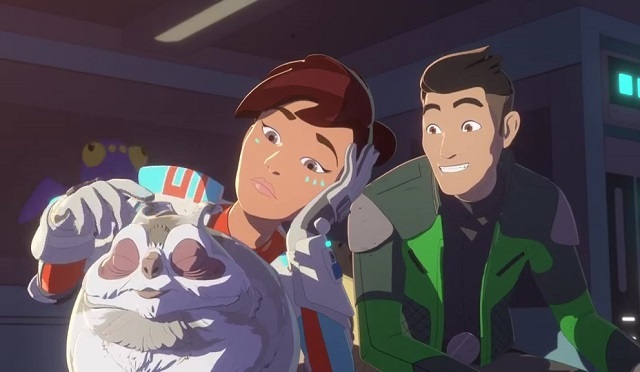 Like with Rebels before it, Resistance seems to be embracing a semi-serial form of storytelling, where each episode stands on its own but story elements and character moments bleed over to those before and after, interconnecting the whole series. » Read more..